Depending on your industry, having a Scraped Surface Heat Exchanger (SSHE) may be essential to making your daily applications run smoothly. The various types of SSHE’s are designed to fulfil specific applications based on your needs. Below is a list of industry specific products that benefit from a Scraped Surface Heat Exchanger. Heat Sensitive Products – Delicate products, which are negatively altered by a prolonged exposure to heat, are effectively processed in a SSHE. The scraper blades prevent product from remaining on the heat transfer surface by continuously removing and renewing the film. Because only a small amount of product is exposed to heat for just a short period of time, burn-on is minimized and in most cases eliminated entirely. Viscous Products – SSHE processes viscous products far more efficiently than conventional plate or tubular heat exchangers. Product film is continually scraped from the heat transfer wall to induce high heat transfer rates. A constant agitation causes turbulent flow for a more consistent heating or cooling. Pressure drops are effectively controlled by the product annulus area and agitation eliminates stagnant areas and product build-up which makes cleaning easier. Particulate-Laden Products – Products with particulates, which tend to plug conventional heat exchangers, are easily controlled in a SSHE. This allows for the particulates to maintain maximum product identify. Crystallized Product – Products which crystallize are ideal candidates for SSHE processing. As product crystallizes on the heat transfer wall, the scraper blade removes it, which in the end keeps the surface cleaner. Food and Meat Processing – SSHE can serve the food and meat industries in an extensive variety of applications. Whether it’s cooling, heating, sterilizing, crystallizing, freeze concentration, or processing a hard to handle product, the Scraped Surface Heat Exchanger is able to meet the most precise and challenging standards. Aseptic Processing – SSHE’s have many uses in aseptic processing, particularly those involving viscous and particulate laden products. These aseptic systems sterilize food and other perishable products before they are sealed in pre-sterilized containers, which allows for distribution by non-refrigerated means. Contact BEECO for more information regarding scrapped surface heat exchangers and their applications to your process. These flexible GS Consistator LD units are particularly suitable for heating or cooling of low to medium viscous products such as confectionery, starch, sauces, dressings, and products containing particles. Completely sealed, fully insulated, corrosion-free stainless steel casing and a special environmentally acceptable material for insulation guarantee years of trouble-free operation. The standard scraper system in Perfector 180 is the Bulldog system featuring two rows of plastic scrapers. The scrapers can be inspected and replaced without removing the rotor. You will achieve excellent results for large-scale production of high-viscous products when using GS Kombinator 250L. The Kombinator 250 SHCW is mainly for low fat spread emulsions containing high amount of protein and stabilizers. Supreme creamy ice cream is achieved by the low temperature extrusion process. Reliable performance and compact design are key words for this machine. The standard scraper system is the Bulldog system featuring two rows of plastic scrapers. The scrapers can be inspected and replaced without removing the rotor. The standard scraper system consists of floating scrapers manufactured in plastic and mounted on sanitary supports on the rotor shafts. 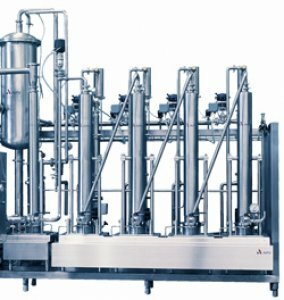 The modular Pilot Plant for Fat Crystallization features a high-pressure pump, chilling tubes, various kneading units and resting tubes. The Votator 4 x 120 is a unique concentric scraped surface heat exchanger designed for heating and cooling moderately viscous products. The Votator Extra Heavy Duty units are designed for heating and cooling products with viscosities in the 1,000,000 centipoise range. All systems rely on the unique efficiency of Votator® Scraped Surface Heat Exchangers in achieving quick, consistent production of crystal nuclei. The Votator II incorporates the most popular features of the Thermutator and Votator lines, making it extremely easy to maintain.